Do you know anyone who answers the question “What kind of music do you like?” with “Oh, all kinds”? We all do, and Kilmaat is not for that person. 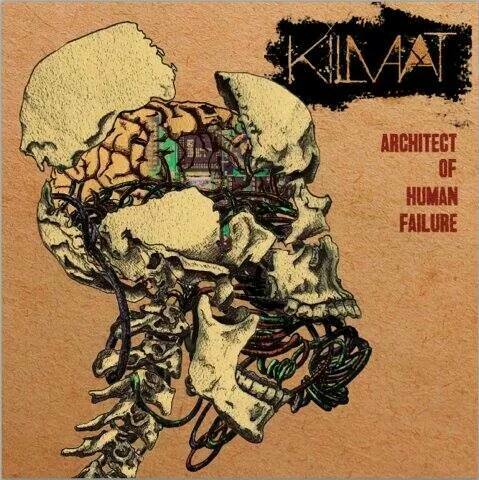 Heavy metal runs deep in the veins of Kilmaat’s first record Architect of Human Failure, being carefully constructed and arranged with a sound so dense that you can physically feel the weight of the songs. The sludge floods this album as the complex, progressive metal songs are at times like trying to walk through quicksand. Most tracks are relentless like “The Dead Die Alone” but on the song “Architect of Human Failure” the band is seen at their most patient, letting the song unfold like a Pink Floyd composition tuned to the floor. “Scalers of Golden Mountain” is a great example of how the grinding, machine gun guitars give the songs an aggressive added weight. The low, growling vocals will wear on you after several songs because the lyrics are difficult to decipher. It makes sense that this thick of music wouldn’t make anything easy for the listener though, like on “Redemption Denied” the hammering drums and thumping bass make sure you know there will be no reprieve from the doldrums. Power chords don’t survive on these songs because Kilmaat’s music is much more intricate than that and the deep, growling vocals may scare some away but will hit right at home with who they need to. This entry was posted in 250 word album reviews, Local Album Reviews and tagged 250 word album review, Architect of Human Failure, dense, heavy metal, Kilmaat, Local Albums, metal, Missouri, St. Joseph. Bookmark the permalink.